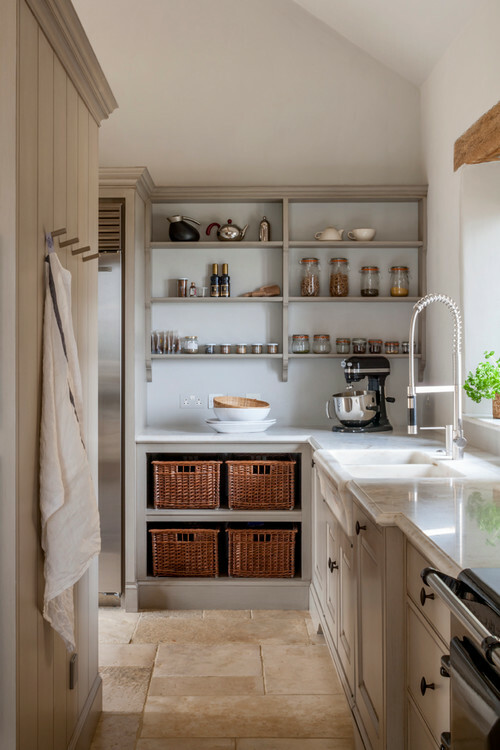 Home » Decor & Design » Kitchens » Butler’s Pantry VS Scullery – What’s the Difference? 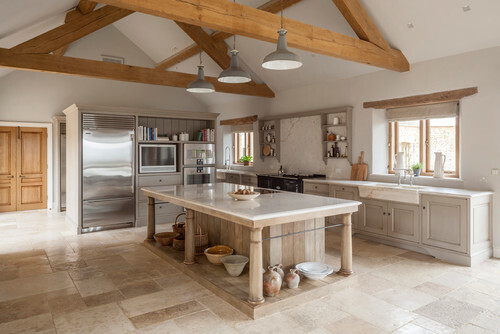 This is a modern-day farmhouse kitchen – and a very nice one at that. Today, we enjoy gathering in the kitchen with family and friends. For most homes, the kitchen is the heart of the home. However, if you could stroll back into days gone by to a kitchen as elaborate as this, you would eventually arrive at a time where the only people you would find here would be the servants. Lavish homes like this would most likely be a place that held frequent events, fed multitudes of people, and required many kitchen hands to get the job done. Enter the scullery – and yes, this kitchen has one of those, too. The scullery was the place where the cleaning up could be done. I am sure that you have heard of a scullery maid before. Well, she had the wonderful job of doing what we would now think of as a bus boy’s/dish washer’s job. So, where is the scullery in this kitchen? If you haven’t located it yet, shift your eyes to the space behind the refrigerator. 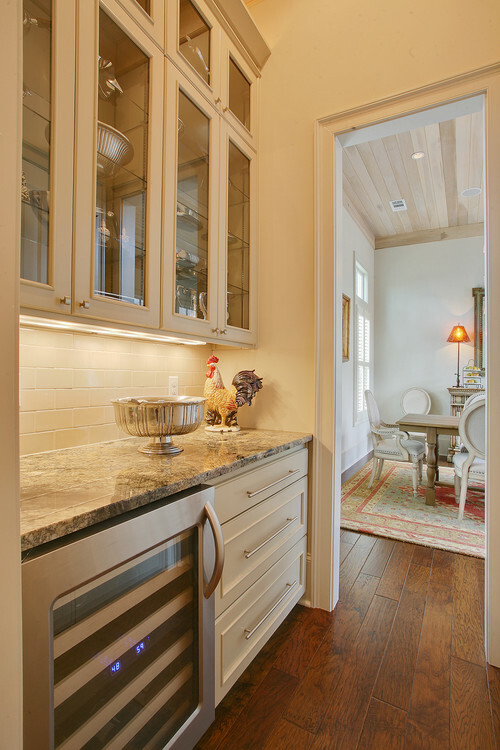 (FYI – I have a few mood boards on Farmhouse styles here, if that is your design of choice). Now, if you could walk behind that refrigerator, this is what you would see – a modern-day scullery. Pretty snazzy, wouldn’t you say? Sculleries are located just off of a kitchen, but not in view of the other parts of the home. It has an extra sink and may even have a dishwasher. A lot of the time, extra appliances or rarely used appliances are kept in the scullery, as well. Having a scullery is definitely a luxury. So, if you are on the fence about having one, just ask yourself a few questions? How many events/dinners do I host a year? How many people hang out in my kitchen during these events? Crowded? A butler’s pantry, on the other hand, is not so far out of reach for most of us – assuming you can find 3 x 2 feet of space near the dining room. If we go back in time again, the butler’s pantry is just what it says – the butler’s pantry. The butler’s job typically would consist of prepping and serving, and that is just how this space is intended to be used. (If you have ever watched an episode of Downton Abbey, then you are familiar with the traditional differences between a butler and a kitchen hand). Photo by Highland Homes, Inc.
You would normally find all of the nice place settings located here, as well as the good silverware and the linen napkins. This is the place where you want to stop off just before making the grand entrance into the dining room with the desserts. So, a countertop is necessary. But, a butler’s pantry doesn’t have to be elaborate. It can be anything from a simple sideboard placed strategically in a nook, to a fully accessorized and stocked serving pantry. Additions that you might find in a modern-day Butler’s pantry are wine coolers, mini fridges, prep sinks, and maybe even a warmer. The scullery I saw, was explained as that all the heavy messy baking went on in there. You could bring out all the appliances, flour and sugar everywhere and close the door until you had time to clean the mess up later. It was set up with a fridge and oven as well. Yes, they can be as detailed as one would like (or afford). The key word in your description is “mess.” 😉 I have a friend who had a scullery added next to her kitchen, just so the caterer would have a secluded area to cook and clean. It was decked out with all the bells and whistles, too.